Our walls are wetter than they have ever been. This is not because the physics have changed, but because new construction practices are not as easily allowing the moisture that’s getting in, to get out. We have a growing need for increased R-values in our building assemblies along with a steep reduction in air movement through the wall. While these efforts are great from an energy-efficiency standpoint, the lower rate of drying is now presenting our industry with new challenges that cannot be neglected: once these walls get wet, they are staying wet. Not making things any easier is the advent of new business challenges: popular cladding products hold moisture, the rate of building failures due to moisture keeps increasing, building codes are driving tighter construction and enhanced energy efficiency, and there is a growing shortage of skilled labor and training available. The use of continuous insulation on building exteriors and the air tightening of building envelopes only increases the need for the elevated drying potential of fiber glass insulation in the framing cavity. We seem to keep finding ways to add more layers and new materials to our building envelopes. While these additional layers have helped reduce energy losses they have not managed to keep water out of our walls. We are human and people make mistakes—like occasionally tucking their raincoat into their rain pants—but we also suffer a disconnect between expected material performance and practice. Hey here’s shocking news: in the US “self-flashing” residential windows are allowed to leak from “the nailing flange out”. Consider now how you are integrating the wrapping of the rough opening with the water resistive barrier and the continuous insulation to ensure that the water which will come on the face of that window nailing flange is going to be re-directed to the exterior. Will it wind up in front of or behind vapor resistive layers? If it is behind resistive layers, chances are very good the direction of the highest potential rate of drying is actually towards the interior. The vapor open nature of fiber glass, combined with an adaptive “smart” vapor retarder where needed, provides the assembly with the maximum potential for drying moisture that may intrude in these scenarios. It’s a little ironic that with regard to moisture management, what had been considered fiber glass’s “Achilles heel”—being so vapor open—may actually be one of its best benefits. While working to reduce our consumption of energy, we must always keep durability as a principle concern, for there is nothing sustainable about a building that can’t last. It is important to explore these concepts and practices and dig into a thorough understanding of what impacts we can expect in the future due to increasing the energy efficiency of the building envelope and increasing the airtightness levels of today’s homes. Here is a hint—we can expect the drying potential to be reduced; whereas, our buildings are still getting wet (and may in fact get wetter over time…). Managing this moisture will be the key to successfully building the sustainable homes of the future. Hi Mick, great catch and in most situations you would be correct, but this is not most situations. I went back to Lucas for the response: “The vapor retarder in the picture is “MemBrain The Smart Vapor Retarder” that changes its properties depending upon moisture in the cavity. It prevents wetting from outward vapor drive and promotes drying should moisture intrude from the exterior. Other types of vapor retarders don’t do this, at least not to the degree that MemBrain does, and not knowing about new materials and solutions on the market has left folks feeling exactly the way this respondent does. That’s why we really want folks to attend our new webinar. They can start to imagine how they can incorporate some of these materials coupled with older techniques in order to put “breathability” back into the assembly. It’s a great comment that goes straight to our point.” If you’re interested in that webinar Lucas references it is, Learning to Breathe Again and it is tomorrow at 12 p.m. EST. Excellent question. Keep challenging us! The photo at the top of this article doesn’t seem to help with the promise of “How to correct it” either. Unfaced fiberglass batts with a vapor barrier being installed at the warm side of the wall? If the unfaced batts were covered with drywall only then MAYBE vapor drive would be able to get to the interior. All depends on the building location (heating and cooling load) and what was installed at the exterior of the studs. MemBrain is a great vapor barrier option. 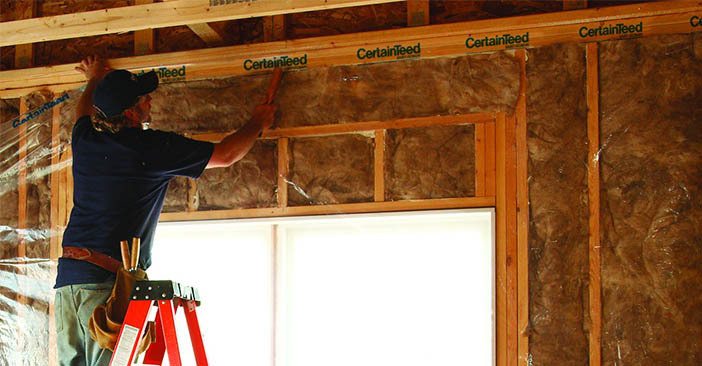 You can find more about how and where to use it, here: https://www.certainteed.com/building-insulation/products/membrain/. It’s also, now available on Amazon so you can have it shipped to you directly. I am glad to see this addressed. Too much emphasis is placed on R-value and not enough on building to last. Compared to many European buildings ours sometimes look somewhat temporary. I didn’t find anything mentioned about how to correct it. I was looking for information about your “MemBrain” product as a possible vapor barrier. Great article! Realized the new siding and insulation, new windows, and new garage doors made a huge difference. Added insulation in the attic and suddenly our lower level became musty. The original HVAC simply couldn’t keep up with the non-drafty house! Added a new high-energy HVAC in 2010. We are much more comfortable and using less electricity to cool and far less gas to heat in cold Nebraska winters. It’s been a win-win purchase which has paid for itself over the past five years! This is an interesting point. Hadn’t thought of that. The headline says “How to Correct It”. The copy says nothing of the kind; it merely presents the issue as one with which the industry must grapple. Please do your readers a favor and write an article on how to do it right the first time and how to correct existing issues. Interesting article but I was expecting more regarding how to correct the problem.